Our daughter Emily and her husband are moving up from their home along the Gulf this weekend, to stay with us until they find a house. I am so delighted, knowing that we'll be able to enjoy them while they are here and then they'll be living in our same state. Family means everything to me, and now we'll all be able to get together so much more often! In preparation, I've been clearing out our downstairs guest room (Emily's while she was growing up) and that process has been a--ahem--revelation. Our house is a ranch with a walk-out lower level, no attic for storage, and has small closets. When my parents passed away, sentimental me wanted to keep every memento of the past. And oh, the mementos! My mom grew up on a rural Kansas farm during the depression. Her father, who had immigrated from Sweden as a young teen, hadn't been a successful farmer in the first place, and the depression left the family very poor. Still, my mom managed to finish high school by working as a live-in nanny, put herself through nursing school, worked hard, married and had a lovely home in Minnesota. She and my dad traveled a lot and she had a wide circle of friends, but the effects of the depression always lingered. She was frugal, very sentimental, and even saved all of the greeting cards and letters she ever received. 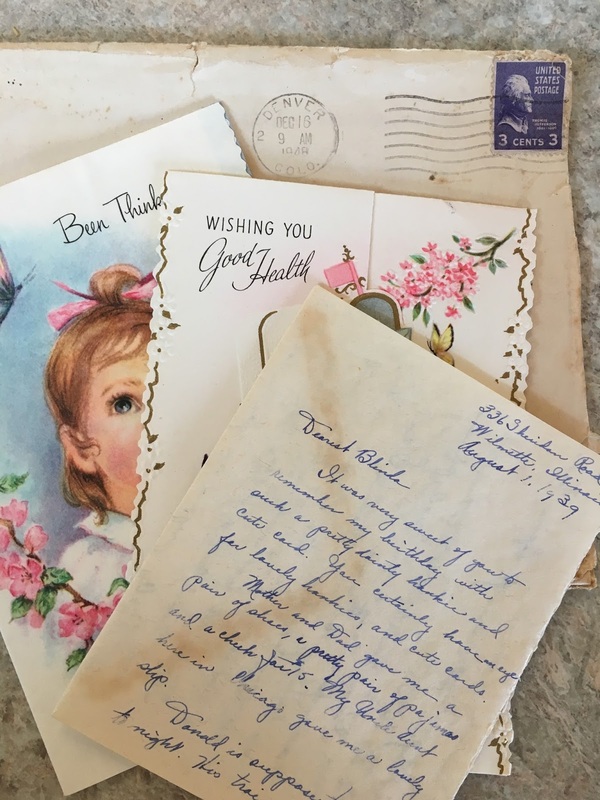 While my brother and I were settling my parents' estate, I couldn't bear to let anything go that was a poignant reminder of my gracious, loving mom Arline, and I ended up with a stack of storage tubs filled with just correspondence. Not only hers, but all of her sister's, who had passed away a decade earlier and who also had saved everything. What a treasure trove! And from such a different time. These days, a handwritten letter is a delight, and even greeting cards aren't exchanged as much as they were. I've found ribbon-tied packets of over forty get well cards, fifty anniversary cards from a single year...and oh did the people of generations past ever write letters. Long letters--three and four and five pages long, the ones sent to grandparents post-marked back to the1920's and in Swedish. The one in the photo was sent to my aunt in 1929, thanking her for the pretty hanky she'd sent--a common thing to send as a little gift in those days. In an effort to clear out our guest room, I've spent days this week culling volumes of greeting cards from people I never knew, but saving all of the family cards and letters, and find myself with a veritable family journal--letters back and forth between my mom and her sister Blenda, for instance, that tell so much about my mom's feelings as a young wife and mother, and so much about the years when my brother and I were growing up. What fun! And so special to me, because she's been gone over six years and I miss her every day. All of this has made me start thinking. Today, with family connections at our fingertips via cell phones and email, who still writes long letters? And, with our modern lifestyle, do people even tend to be sentimental enough to keep all that they receive? So much documentation is being lost, of family history, and the concerns and joys that were once shared. What will be left for future generations to discover and treasure? Do you still write handwritten letters? I'm going to try to better, in the future! 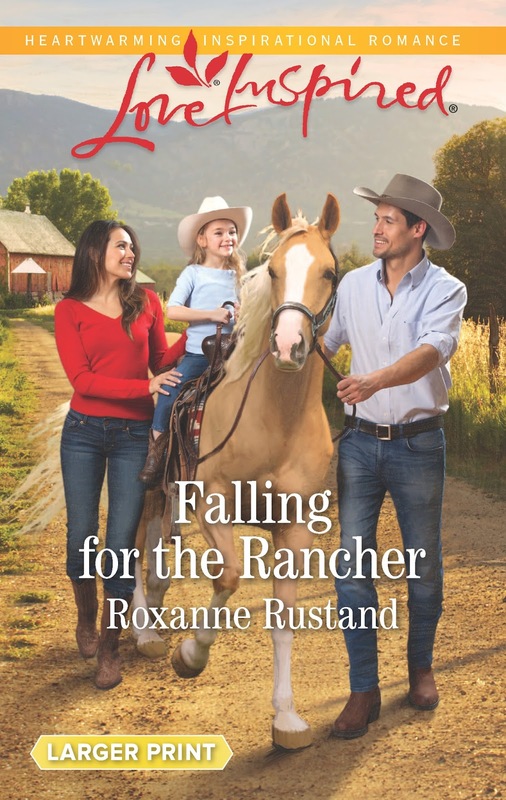 Leave a comment, and your name will be in a drawing for a free e-copy of my newest book Falling for the Rancher, a June Love Inspired release.